Andrew Schroeder of Schroeder’s Outdoor Services LLC in Gibsonburg, Ohio, was named winner of Toro’s 2018 GIE+EXPO giveaway. 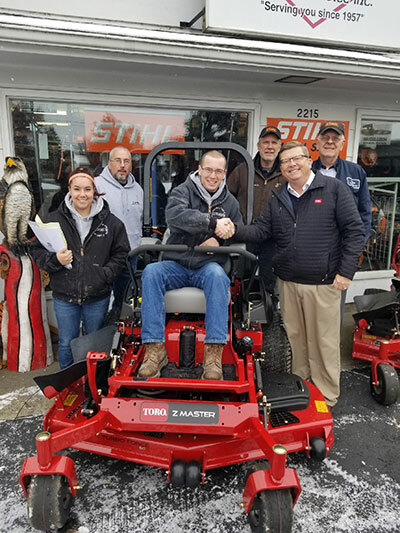 Schroeder picked up his brand new Toro Z Master 3000 Series zero-turn mower equipped with the MyRide suspension system from his local Toro dealer, Willie’s Sales and Service in Fremont, Ohio. Willie’s has specialized in lawn and garden equipment sales and service for more than 60 years. Buck Storlie has been promoted to product line manager for ASV Holdings, a manufacturer of all-purpose and all-season compact track loaders and skid-steers. Storlie will be primarily responsible for determining the direction of ASV’s lines of compact track loaders and skid-steer loaders. He also will be ASV’s leading customer advocate, product and market intelligence expert, and champion of both existing and new product development and life cycle. Storlie, a 23-year veteran of ASV, most recently held a position as ASV’s testing and reliability leader, where he managed product testing, reliability and field issue resolutions. He focused on ensuring customers receive maximum productivity, durability, ROI and comfort out of their ASV machines. Pioneer Landscape Centers promoted long-time Pioneer executive, Kevin Guzior, to COO. Over the past 12 years Guzior has gained experience in the landscaping industry from his numerous roles at Pioneer both in Arizona and Colorado. He will step into his new role effective immediately.